Short break for the coming National Day holiday? ???????????! ??? “? ?” ???…………….??….??…..?? ?!!!!?????,?????”??”? ! ?! kinda tempting leh…. haha… but i planned to go tw during that period.. hk ah.. let me think think… maybe i’ll change my mind bcos been to tw 2 years ago but HK, 999 years ago… Haha..
AHHH i planning to go hk leh! but perhaps around oct… cos still saving money! lol. Celebrating our nation’s birthday in another country? Halo….any idea if these’s a website where we can get more info on the HK/SZ trip??? das, got a sms from member. wanted to know if css2 live recording is done every monday at 8pm. guess she wanna pop by to drop something for u. thanks! wow the tour for 5 days so expensive har including tax leh will be up to 1k loh…I go there 5 days only $600 leh…I am going for Cruz Teng Turkey which is more worth it can see a lot of things some more is Cruz mah..
Hehehehe..why in august leh? I’m heading to HK too,but end of the year.Haiz…. aiyoh, why that ugly photo again ??? 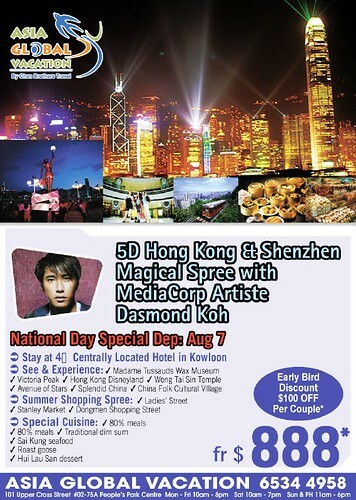 dasmond, which place u thk is more suitable to bring my mom – Taiwan or Turkey? She’s 60yrs.. bt still in very gd health. I am still contemplating btwn these 2 places.. pls advise can?? oh my, i wanna go i wanna go. To Jess, depends on wat she’s interested. Turkey is very much abt traveling and sight seeing, and most prob u will hv to join a tour grp. no.. my mom doesnt speak English. Okies.. I will decide on Taiwan den.. xie xie!